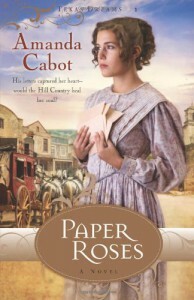 Paper Roses by Amanda Cabot is a Christian historical romance, but it has wonderful elements of mystery and suspense sprinkled in, as well as a few other subplots. There were times that I felt like there may have been too much going on in just one installment, but I must say, Amanda Cabot did a wonderful job of meshing everything together. The Christian values portion makes this story into one that I am thankful to have read. It reminds us that although our heartaches can be devastating, God will turn them into something that is quite remarkable. This is hard to recognize at times, but this novel shows us that although we are not protected from the hurts of this world, trading in our bad times would alter the outcome in ways that may be equally as devastating.The romance is wonderful! The characters are broken people who come together in the most amazing way. I do not wish to spoil the story, so we will leave it at that.